SOUTH BEACH, FL--(Marketwired - Aug 11, 2015) - A prominent member of the Collins Park neighborhood in Miami, South Beach Hotel has been the choice of many vacationing families seeking both fun and culture during summer. Special events in the vicinity of the hotel, including ARTcamp by Miami Beach's ArtCenter South Florida Studios, had reservation numbers soar to the point that most of the 51 rooms of the recently renovated luxury boutique hotel are already booked for the remainder of the season. ArtCenter South Florida has established a reputation as one of the region's leading creative learning centers and an internationally acclaimed world-class cultural center. Since it was established in 1984, it has contributed to the South Florida arts community by helping advancing artists with their careers and retaining talent from across the globe. Through its summer event ARTcamp, ArtCenter offers the expertise of top South Florida art teachers to children aged 6-12. The 2015 sessions, which were set between June 8-19 and June 22-July 3, taught children the basics of drawing, painting, sculpting, and much more in small classes. Just ten minutes away from ArtCenter South Florida Studios, South Beach Hotel is one of the closest accommodation options to this exciting event and a convenient and much appreciated choice for vacationing families. Known as an affordable luxury accommodation, South Beach Hotel has also become one of the main destinations for art and culture lovers worldwide. The award-winning boutique hotel is nestled in the heart of South Beach's renowned Art Deco district, providing easy access to venues such as the Bass Museum of Art, SoBe Art Institute, the Miami City Ballet, and the Jackie Gleason Theater. The fabulous hotel by itself is a work of art that was built by master architect Henry Hohauser and renovated by Casa Conde and Associates. Complementing the stylish exterior is its interior, which combines contemporary décor with a minimalist style across all guest rooms and the lobby. The amazing hotel is the only venue featuring the works of Miami-based photographer/graphic artist Santlov, whose fame rose after his 'ToysRLikeUs' photography campaign went viral. Santlov's versatile and mesmerizing visuals are featured throughout the hotel and can be viewed on tour. 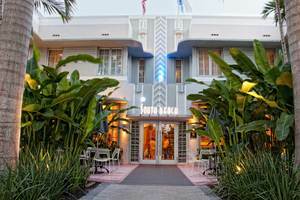 South Beach Hotel has evolved into a gem for art enthusiasts, vacationing singles, couples, and families and welcomes all travellers interested in enjoying the offerings of Miami Beach, like the city's pristine sand beaches or Miami's National Parks. Guests are encouraged to approach the knowledgeable concierge to further inquire about attractions and family-friendly events, or receive help in setting up tours, water activities, and free excursions. Equipped with amenities such as picnic blankets, bicycles, yoga mats, and beach chairs, which can be rented by hotel guests at no extra charge, visitors have everything they need for a fun and relaxing vacation.